A website geared specifically towards the needs of Rural Water Districts and Small Kansas Cities. Unlimited number of pages, ready for you to add content. Your logo and color scheme of your choice. One hour of training to help you get started. Email tech support followup, limited per month. If you need additional or follow up support, it is available at a discounted quoted rate. Functional premium features (see below) not found at this price anywhere! Additional features available at a discounted quoted rate. Free help getting a domain name. Non-live development site so if you already have a website, the transition to your new site is seamless. Subsequent years cost only $100 per year! If you're interested, please email or call and we will send you more information! We can give you a special invitation, then you can try out editing our demo site! 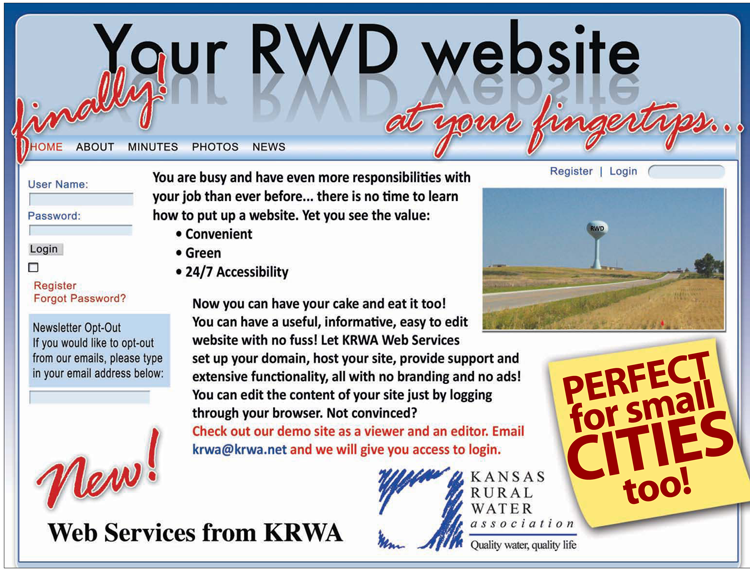 Check out who is using KRWA Web Services for their website!